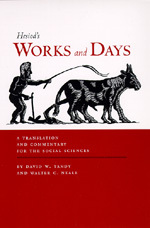 This new, annotated translation of Hesiod's Works and Days is a collaboration between David W. Tandy, a classicist, and Walter Neale, an economist and economic historian. Hesiod was an ancient Greek poet whose Works and Days discusses agricultural practices and society in general. Classicists and ancient historians have turned to Works and Days for its insights on Greek mythology and religion. The poem also sheds light on economic history and ancient agriculture, and is a good resource for social scientists interested in these areas. This translation emphasizes the activities and problems of a practicing agriculturist as well as the larger, changing political and economic institutions of the early archaic period. The authors provide a clear, accurate translation along with notes aimed at a broad audience. The introductory essay discusses the changing economic, political and trading world of the eighth and seventh centuries B.C.E., while the notes present the range and possible meanings of important Greek terms and references in the poem and highlight areas of ambiguity in our understanding of Works and Days. David W. Tandy is Associate Professor of Classics at the University of Tennessee, Knoxville, and coeditor of From Political Economy to Anthropology: Situating Economic Life in Past Societies (1994). Walter C. Neale is Professor Emeritus of Economics at the University of Tennessee, Knoxville, and author of Developing Rural India: Policies, Politics, and Progress (1990).